Digital art software gets better and better each year. The right software can help you paint faster and feel better about your artwork. Each program handles brush strokes and color blending differently, and the price tags vary from expensive to free. Adobe Photoshop still reigns supreme as an all-round industry standard for digital artists. Yet there’s always new software coming out to compete against Adobe’s throne. Choosing your art software is no longer about the biggest features, but rather finding an application that suits your specific needs as an artist. Beginners who just want to practice are better off choosing a free program compared to professionals who want to learn software for an industry job. If your goal is to work for a game studio as a concept artist then you’ll probably have a different set of goals. In this post we’ll take an in-depth look at 7 of the most popular programs for digital drawing & painting by comparing their features and seeing how they stack up. If you need a bit more info on these programs just keep reading. Adobe Photoshop is the most popular and widely used software for digital art. It’s feature-heavy, regularly updated, and you can use it to create everything from concept thumbnails to comic book pages or even photobashed pieces. Photoshop started as an image-editing program for photographers. Over time it slowly became a staple for many other industries, digital art included. With this software you have a huge variety of painting tools, brushes, filters, plugins, and layer styles. It’s an industry standard for all digital artists across the entertainment industry because it just works. If you want a career in video games, animation, feature films, or any general production studio, knowledge of Photoshop goes a long way. The learning curve is pretty steep here. If you are a beginner you may feel overwhelmed by all the options and get lost in technical aspects of the program. But once you’ve learned the basics, your imagination is the limit! You can do anything in whatever style you choose and edit photos to boot! Being the most popular software for creatives artists, there’s a mass of Photoshop tutorials available online. Adobe even released a series of up-to-date free tutorials which will take you from beginner to expert level. If you ever have a problem or question on anything, a quick Google search will get you a video answer or helpful forum post. 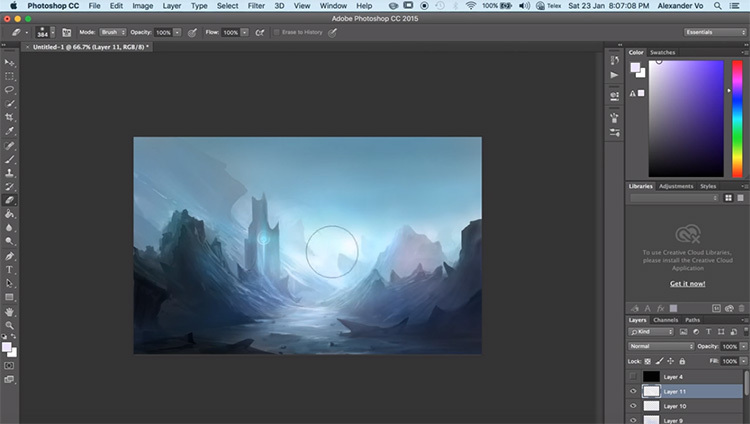 Concept artists like Photoshop’s custom brushes and often create their own. Detailed layer settings, regular updates, and a sleek user interface are the driving force behind Photoshop’s continued popularity. You can rotate your canvas naturally to mimic the rotation of paper. And you can setup grids and rulers for complex scenes, or even bring in 3D objects to paint over. PSD files(Photoshop’s native file format) play well with other Adobe programs and this file type is an industry standard. That means you can import PSDs into almost any other art software without a hitch. GIMP and Krita both accept PSD files along with many other programs. This is why many artists combine Photoshop with other painting software. 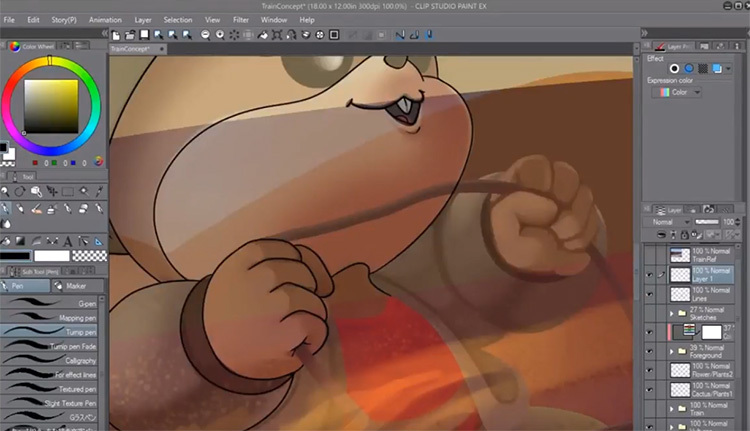 Depending on the workflow you’re going for you could do your concept and lineart in something like Clip Studio Paint, then bring it to Photoshop for coloring and final touch-ups. Other digital art software doesn’t try to replace Photoshop but instead tries to improve on the interface for specific types of art(ex: comics, storyboards, environment paintings, etc). Once you’ve signed up for a Creative Cloud membership you get a free, non-conditional seven-day trial version of Photoshop. This offer applies to Adobe’s other software as well. If you like Photoshop and want to buy it, there are four purchase plans to choose from. The cheapest is the Photographers package which is $9.99(only available annually) and it includes Lightroom CC. If you want to buy a monthly plan you can get Photoshop for $29.99 a month. If you want to go the extra mile and get the rest of Adobe’s software, the entire suite costs $74.99 monthly(or annual for $49.99 p/m). Bonus Tip: Students 13 years and older get a 60% discount on the full Adobe suite plan! People love Photoshop for its versatility and wealth of free knowledge online. Adobe has thrown millions of dollars into development so Photoshop isn’t going anywhere. It’s a solid, professional choice for aspiring digital artists and concept artists. Corel Painter is characterized by painterly brush strokes and a traditional artist’s feel to the interface. Painter is for artists who love loose, messy brushwork and want to capture the beauty of traditional mediums on a digital canvas. It comes standard with 900 brushes covering every possible situation you could imagine. As you might guess from the name, Corel Painter is focused on painting. But this should be great for artists who only want software to draw or paint digitally. It has a 2.5D brush toolset that mimics real-world brushes giving you full control over the final “style” of your work. Painter has been a serious alternative to Photoshop for several years and is the company always listens to user requests. They’ve been working hard to add new features every year and have added a bunch of artist-suggested tools into their latest release. For example, some users complained of UI sensitivity and slow response times. Those issues were fixed with the 2019 version along with an entire UI design overhaul. Icons were redesigned to be more intuitive and the interface was changed to a darker theme. Among all the new features with that version, the most celebrated was the pinned color wheel. You can position the color wheel wherever you like on the screen giving an instant look at color options without swatches. This spectral feature means you can work in detail without the circular brush icon obscuring your view. 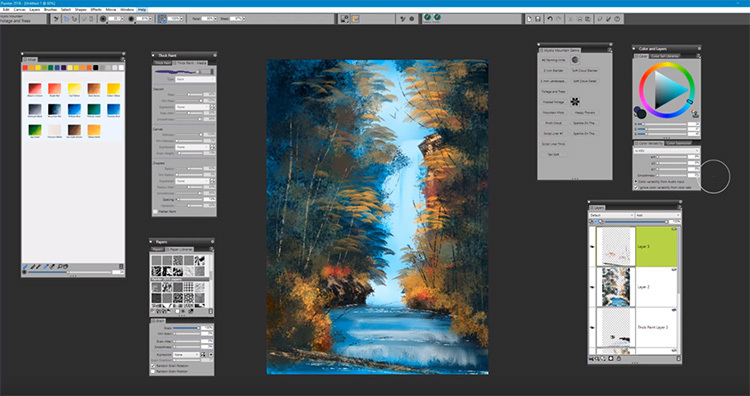 In Painter’s web series “Paint like Bob Ross” you can learn how to paint digital landscapes in 30 minutes using their brushes—a great introduction to conceptualizing landscapes for beginners. The software is feature heavy and beginners might still feel overwhelmed by the sheer number of brush options and settings. But Corel is worth learning because it is another trusted industry staple among character designers, concept artists, and visual development artists. Corel Painter has been around since 1992 and you can find an extensive library of free tutorials on their website. Or if you search on YouTube I’m sure you can find plenty of free tutorials there as well. You won’t find as many resources compared to Photoshop. But Corel Painter is still a beast in the concept art world, or just the digital painting world in general, making it an awesome choice for hobbyists or newbies just picking up digital art for the first time. As of this writing, a brand new copy of Corel Painter costs $350 making it an expensive once-off purchase. Although you can get a free 30-day trial to demo the software and see if it’s right for you. 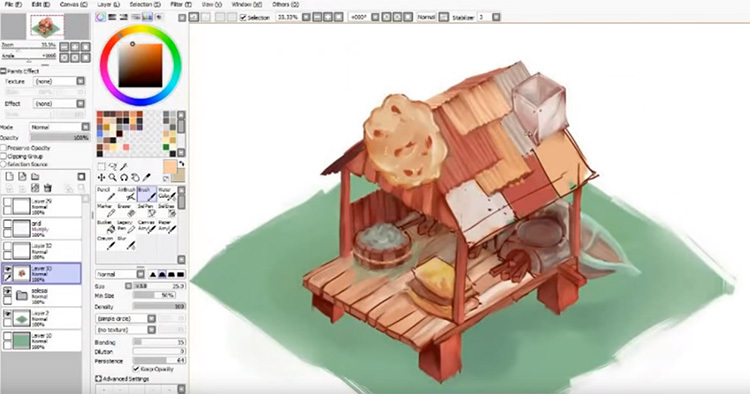 Krita is a free open source digital painting program designed for cartoonists, illustrators, concept artists, and pretty much all digital artists. If you have a background in some other digital art software(Photoshop for example) then Krita’s tools will be a little familiar and a little not-so-familiar. Whether you’re switching or just getting into Krita it’s worth the time to watch a few tutorials to find out how everything works. Krita hasn’t released many official tutorial videos but they have created detailed documentation online. If it’s your first venture into digital art then start off learning about the basic UI and toolsets. Use the pop-up pallet to select your brushes, erasers, and colors intuitively. All other tools are stored in the panels to the left and right. 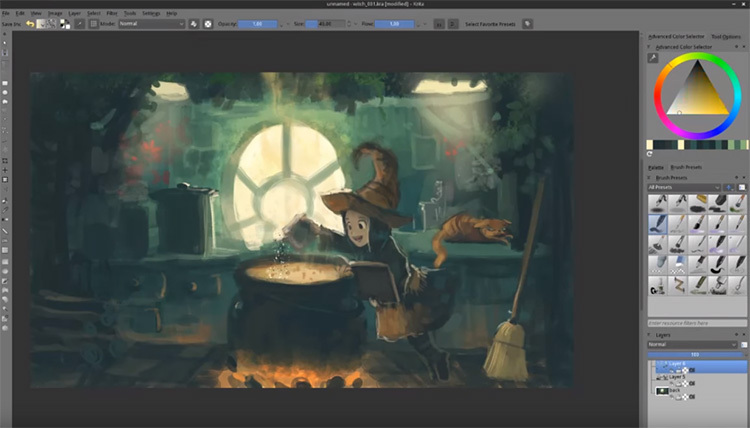 Krita supports PSD files so that you can switch between Photoshop and Krita with ease. And there’s a ton of freebies online like free brush packs that mimic everything from charcoal to watercolors and so much more. The beauty of Krita is the free price tag and the immensely supportive community around this software. Krita has been criticized by some professional artists for its lag, seemingly unintuitive design, and uneven brush softness. Although the criticism has merit, the program’s core features work well and you will learn them with practice. Also worth noting this has to be the absolute best choice for anyone on a Linux machine. Photoshop does not support Linux outside of a virtual emulator but Krita can run natively in any Linux distro. This is a huge +1 for Krita since it’s really the best digital painting alternative for our Linux & Unix friends. If you don’t have the cash to burn on digital art programs Krita is the perfect choice. Use the program while you save up some money to grab another program. Or just stick with Krita and use it free for life! Many professional artists like David Revoy create all of their work with Krita and their stuff looks amazing. Best thing about Krita is that it’s simple for beginners to learn and it doesn’t confuse you with a ton features or fancy tools. Krita’s purpose is digital painting and that’s precisely what it does well. Clip Studio Paint is the most popular software for creating comics and manga artwork. Clip Studio Paint was originally named Manga Studio but changed names in 2013. It originated in Japan as specialist software for manga, illustration, and animators. The program has long been a worldwide affordable alternative to Photoshop for digital artists but got more recognition with the name change. The most notable drawing difference between Clip Studio Paint and Photoshop is the brush tool. In Clip Studio the brush tool instantly corrects any minor wobble you make while drawing on a tablet, leaving you with smooth clean linework. Clip Studio is optimized for comic book creation and has various tools to speed up the process. A canvas layout tool makes paneling quick with perspective rulers and a library of predefined formats. The pen tool lets you to work in a versatile vector format which means your creations can be scalable without quality loss. In the most recent release there’s a new library of 3D objects and posable models. This is useful for concept artists who like to use references to get poses down quickly. You can drop in a 3D model, pose it using an intuitive joint system, change the camera angle, make the character fat or thin, and choose between genders. After you’ve drawn over it you can use that same model’s shading as a reference for lighting. Then when you’re done just delete it. Easy-peasy. With CSP your art will always have a crisp digital finish as the software doesn’t strive for a traditional look. Although it’s possible to give your brush strokes a blended texture using brushes, Clip Studio Paint is not designed to mimic traditional mediums. The standard version of Clip Studio Paint also comes with some very basic animation features. You can quickly test character movement over 24 frames without the annoyance of switching programs. But this is not really the best software for animation so it works best in conjunction with other programs for that purpose. Now Clip Studio Paint comes in two versions: PRO(standard) and EX(full-featured). Unless you’re planning on putting all of your projects through Clip Studio Paint and creating various manga & comic books, you’ll probably be happy with the PRO version. The EX edition has only a few extra features that would benefit expert users. EX lets you save manga & comic pages in a ‘book’ which acts like one editable file. You can then bulk save them for printing which shaves off a ton of time and organizational effort. The animation feature also gets an upgrade with EX and you can create an unlimited number of frames(instead of the standard 24). EX comes with filters for 3D assets too turning them black and white for easier integration into your scenes. Generally speaking, the PRO version is the same and EX minus the above features. It’s unlikely you’ll need those features as a digital painter or concept artist. Only serious comic and manga artists would find the EX features useful. Try out either version with a free 30-day trial of both PRO and EX versions. If you don’t like it then just move on. The free version does give plenty to toy with so you’ll know whether you like CSP or don’t. And it’s worth mentioning that the PRO edition is an affordable option at only $49 flat fee, while EX comes at a premium of $219. Although sometimes you can get CSP at a discounted rate from annual sales so keep checking their prices. GIMP is another open source program built as a free Photoshop alternative. Back when computer graphics were slowly becoming “a thing” it was up to software developers to create graphics for companies. With Photoshop costing a lot more back then, buying it was out of the budget for many companies. GIMP was built to fill the need for a cheaper option to digital imaging editing software. Unlike other free digital art software, GIMP was designed to be a full replacement for Photoshop. This means you can use it for digital painting but it’s really meant for graphic design, photo editing, text effects, and similar features. Likewise this program has all the tools you need for digital art. If you are looking for Photoshop’s functionality without the price tag you’ll be happy to with GIMP’s default functionality. If you know a little about software development you can also add to GIMP’s code by creating your own plugins for the system. But the default setup is more than enough for artists. Many versions of GIMP have been released over the years, but their team of volunteers hasn’t been able to keep up with the sheer financial power of Adobe. The user interface is definitely unrefined and will be very confusing to beginners. There are loads of GIMP tutorials created by their loyal users and there’s enough content to help you learn everything you need about the software. Although GIMP doesn’t have a dedicated support team to answer your questions, many issues are well documented on various forums and you’ll be able to troubleshoot a solution with a few Google searches. The painting tools are reasonable, although in my opinion Krita is a stronger option if you just need painting. Granted you can find plenty of free GIMP brushes all made for digital drawing & painting. But really this software is the best all-round alternative to Photoshop. If you see yourself doing a bit of design work, some painting, and some photo editing, try out GIMP and see what you think. ArtRage is a digital painting powerhouse that’s perfect for traditional artists moving digital and for existing professional artists. Unlike other digital art programs, ArtRage has stepped away from the complicated user interface and ditched the blocky side panels. They want your focus on the canvas creating great work. When you open the program you’ll find a semi-circular brush picker on the bottom left of the screen and a color picker on the bottom right. Both give you immediate access to the most important tools. Small “pods” containing extra options hover just above the circles, minimizing extra clutter. After you’ve picked your color and brush you can start drawing on the canvas. The UI automatically disappears(although this setting is optional) and without the UI you get a full screen canvas to work on without any distractions. Pretty cool! If you’ve never used digital painting software before then ArtRage is fantastic. It’s beginner friendly and super affordable. You can start off slow, familiarizing yourself with the various brushes, and slowly work your way up to painting full scenes and character designs. If you are coming from Photoshop you’ll find the minimalist layout refreshing and easy to pick up. The brush presets are so good that you don’t need to waste time adjusting them much at all. One of ArtRage’s most exciting features is called “real color blending”. It calculates realistic color mixing as you paint and it’s useful for digital painting in an oil or watercolor style. If you want to try your hand at digital painting for the first time, this software will hold your hand and take you from hobbyist to professional if you put in the effort. It doesn’t have all the gadgets and gizmos that some prominent art programs have, but it’s got all you need to make fun paintings(and a little extra). ArtRage is budget software and friendly to those getting started. You can also use the demo version for an unlimited amount of time. The demo doesn’t let you save anything, which of course is a drag, but you can use that to familiarize yourself with the program. If you decide you want the full version it costs $79 and you’ll receive all future updates included with your license. If that sounds a bit expensive you could go for ArtRage Lite which is only $29.90. The lite version is great for beginners and includes all the painting features of the full version. Think of this much like Krita but aimed for simplicity. It’s cheap enough that you could run ArtRage for life and it’s certainly refreshing when you come from a big bulky art program. Lastly on this list is Paint Tool SAI: a simple painting program that’s exceptionally popular among anime & manga artists. Paint Tool SAI was first released in 2008 to a wave of popularity. It quickly spread among the art community who loved the clean brush strokes and unique interface. SAI is a small, old program and has not been significantly updated over the years. It only runs on windows and has a limited set of features. That being said, it’s aged remarkably well and is easy for beginners to pick up. Many artists use SAI to achieve a digital watercolor effect where the blending modes can mimic watercolor, but the overall feel is smooth and sleek. Others use it primarily for lineart, or for creating a ton of anime. You’ll find that Japanese artists almost exclusively use SAI for their artwork. It’s a very popular choice in Japan, likely because this software was originally developed by the Japanese Systemax Software. SAI’s learning curve is minimal and if you’re coming from Photoshop you’ll pick it up almost instantly. It’s still very detailed though and great to use as a sketching program. Use the pencil brush to get realistic sketches down on a textured canvas. Then switch over to brushes and color your line art to completion. Now there are some minor limitations like that new projects are limited to 256 layers per canvas. It’s also known to slow down with larger file sizes and glitch when trying to preview .gifs in the explorer window. They also have a weird system of brushes where you can import textures to merge with brush styles and create totally new brushes. I haven’t mastered this setup but you can find a ton of textures in this post with dozens of free brush assets for SAI users. SAI is a Japanese program and is priced in JPY(Japanese Yen). It costs ¥5400 which roughly equates to $49. Compared to other software on this list, SAI is a tad on the pricier side considering the last update was in 2016. Small complaints aside, considering the price tag and the anime-centric fanbase I’d say SAI is an awesome choice for anime lovers the world over. Get started using SAI by following some easy beginner tutorials on painting in the program. If you put in the time you’ll be a pro within a few weeks. A fantastic program for anyone serious about anime-style art or any kind of digital painting. Biggest downside is you’ll have to be a Windows user. Although if I had to cast a vote for the absolute best digital painting software, that title falls with Photoshop. Here’s hoping even more digital art software comes out in the next 10 years and gives some stiff competition to Adobe’s reign.